This video clip shows the preparation of a ten square metre seedbed, ready for sowing or planting. 3. Dig the soil to the depth of a spade, turning the soil to bury any weed seedlings, and breaking up any large clods as you progress. 5. Tread over the bed using ‘pigeon steps’. Place your feet close together so that you tread over the whole surface, gently compacting the surface. Digging fluffs up the soil, making the surface uneven. Treading gently treading it primes it. I was shocked when the editor of a well-respected gardening magazine wrote to me when I recommended pigeon stepping over a seed bed “You can’t encourage people to walk on a garden bed!” But pigeon steps are vital to effective seed bed preparation, not optional. In this video you will notice I saved a self-sown lettuce and a self-sown endive plant. These were within the rows of corn that I planned to sow later. Their retention does not affect crop rotation. This is my standard method for seedbed preparation and, over five years, helped create the fertile, freely draining, easy to dig soil that has sustained consistent crop production through drought (2005 – 2010) and summer floods (2011, 2012, 2013). 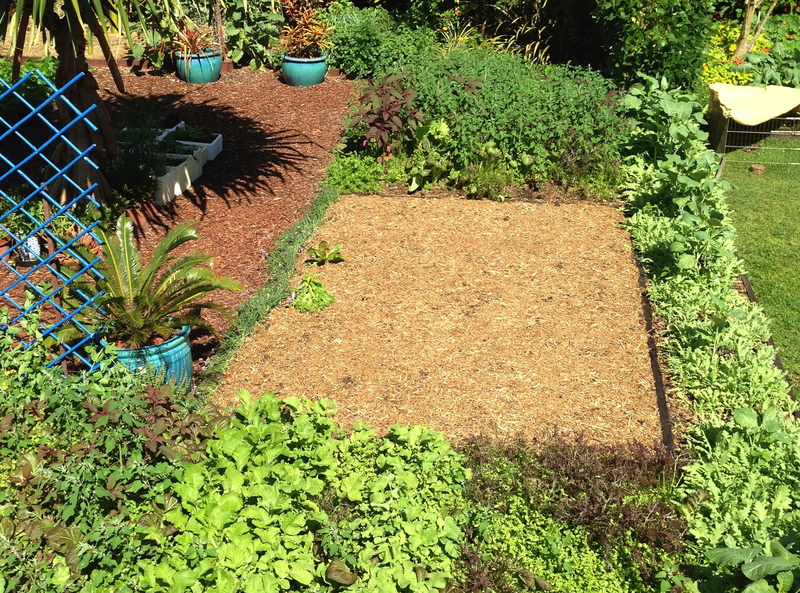 After sowing with corn, I thinly mulched the surface using chopped organic sugarcane. This veneer doesn’t blanket the soil completely, but it does shade it, helping retain moisture and keeping the soil temperature more even, all conditions that aid germination. Thank you for your enticing ‘seed saving’ talk at the Carnival of Flowers yesterday. I am planting my First Fleet lettuce seeds this morning. Cannot wait to share with our ‘friends of Bunnyconnellen’ on their visits to our Cellar Door and Pop-Up Cooking Schools. This is so helpful Jerry. After watching the video I realise I’m omitting some steps, literally. I wonder if I make ‘coo coo’ noises as I pigeon step will it enhance the fertility of my soil? I’ve only just found your blog and it’s a goldmine of info. Thankyou thankyou. This is awesome we have a similar sized block as you about 800m away and our soil is like rock. Suggests I have a lot of prep to do.